At the turn of the century, superhero movies weren’t the box office powerhouse they are today. The original X Men movie, along with Blade and Spider Man helped to usher in the golden age of nerd we live in. Sixteen years later, the X men are still chugging along with the latest in the series, X Men: Apocalypse. Is it worth seeing? Can it compete with offerings from the Marvel and DC Cinematic Universes? Apocalypse is the definition of a 2.5/5 movie. There’s nothing to be mad about. There’s nothing to be pumped about. The series is completely stagnant under director Bryan Singer. If you’ve seen his other X Men efforts then you know exactly what to expect here. All the hallmarks of X Men movies are on full display. Extreme focus on Magneto, Charles and Mystique? Check. Random cameo roles from characters for no reason other than to have them in the movie? Check. Storm being completely wasted? Check. A villains master plan that doesn’t make sense? Check. Bryan Singer not being able to film an action scene? Check. Plot wise, its the same old same old. We’re never really given a reason why Apocalypse needs his Four Horsemen. He wants to destroy the world? Rule the world? Something? We have to take a detour to show that Magneto was in a concentration camp (again) and there’s a really strange line the movie walks between calling back to the last two X Men movies and acting like a stand alone film. Moria McTaggart shows up (I honestly didn’t remember who she was) and hangs around strictly to dump exposition. The movie literately stops for 20 minutes to get in a Wolverine cameo (spoiled by the trailers). As with all X Men movies, there’s a lot of fan service for comic fans, but it all feels meaningless. it all wraps up in a end battle with enough collateral damage to make Man of Steel look like an episode of Mr. Rodgers, where more fan service is used to win the day. Contractually Obligated Jennifer Lawrence looks smoking hot, but is otherwise clearly waiting for her contract to expire. Psylocke and Storm have so little to do that I can’t even really have an opinion on them. Quicksilver gets more screen time and another cool scene, that’s pretty decent. Jean and Cyclops are cool. Jubilee has more screen time in the viral trailer than the entire movie. We have zero reason to care about Angel becoming Archangel as we know nothing about the character. For all the crap we give Batman V Superman on our show (and deservedly so, it’s a colossal turd) at least Zack Snyder and WB/DC were trying to do something different. They failed miserably, but they took a shot. X Men: Apocalypse is safer than a circle of paper. It’s an X Men movie. If you love the X Men movies, you’ll love this. There is nothing new here. If I watched this on FX Saturdays randomly, I wouldn’t think twice about it as background noise. These movies need to dump Bryan Singer and the nonsense with being set in the past. Stop being so beholden to actors and story elements from the older films and go all in with Jean, Scott, Quicksilver and tie into Deadpool for Christs sake. 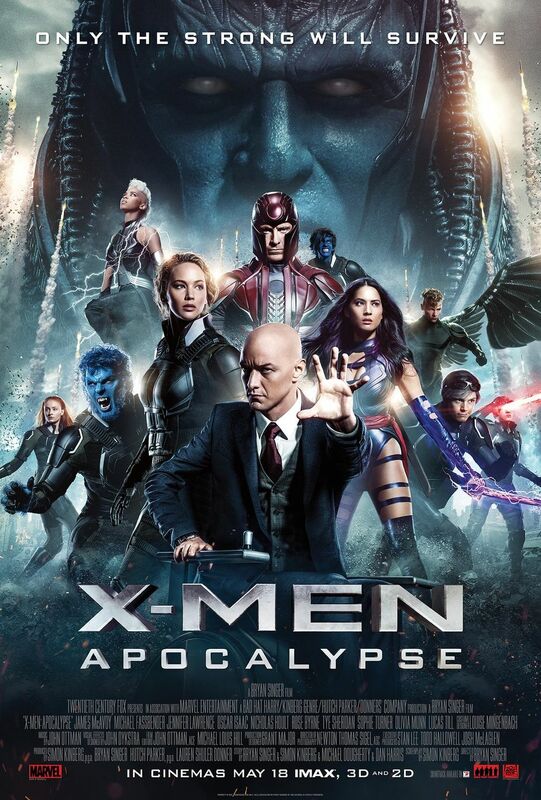 X Men: Apocalypse feels like 2006s hottest superhero movie. . Unfortunately, it’s 2016 and that’s just not going to cut it in the golden age of nerd.